Home / General Time Management / The tortoise and the hare – more than just a fable? The tortoise and the hare – more than just a fable? Research shows that things left undone cause stress. And an expanding to do list, which never seems to empty, is a constant reminder of all the things left undone – important or otherwise. This is true whether it is a hardcopy or electronic list. If we had only today’s work to contend with – and had closure at the end of each day – we wouldn’t experience the anxiety that so many people are experiencing. This is especially true in today’s environment where we seem to have an endless series of things to do. To add to our woes, prioritizing is more difficult, since priorities often change on a daily basis. It’s virtually impossible to list things in order of priority and have them stay that way. One executive mentioned online that he had solved this problem by switching back to something he had used as a child – a pen and notepad. He felt it gave him more control than the various apps he had tried. And he can jot down the things he has to do on a daily basis. He is not the only one who feels more comfortable and more in control using paper. The Caveman Principle, as explained by Michio Kaku, professor of theoretical physics at the City College and City University of New York, says that given a choice between high-tech and high-touch, we opt for high-touch every time. For example, would you rather see a celebrity performer sing at a concert or watch a DVD of the same performance? Or how about a live sporting even vs. a re-run on TV? Balancing high-tech with high- touch can strengthen our brain-based “executive skills, and technology writer Danny O’Brien, who interviewed top achievers, found one thing in common that may account for their increased productivity. They all used some sort low-tech tool, such as a written “To Do” list or a plain paper pad. Writing down your “to do” list on paper frees up working memory, allows time to evaluate their importance, and provides a motivational sense of accomplishment as your cross off each item. Physically writing things down also increases your focus on what you are doing at the time, avoids mental multitasking, and helps you to make a better decisions when selecting the priorities for each day. You could hardly call a 3M notepad high-tech, and yet it was definitely more convenient and faster than whipping out his iPhone and activating a graph app. And probably more effective in getting his point across. 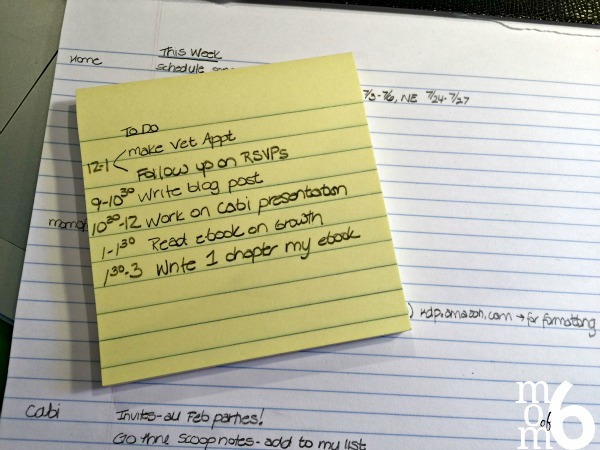 Don’t be embarrassed if you still use a paper planner or scratch pad or sticky notes. Paper has not become obsolete. In fact we recently designed a “scratch pad on steroids” that allows you to quickly jot down ideas, notes from emails or phone calls, record your day’s priorities and To Do’s make notes and reminders and so on. It’s called a “Daily Priority Pad,” comes in two sizes, and you can check it out at our website, www.taylorintime.com. This could apply to all of us. As we rely more and more on technology, will skills such as cursive writing, basic math, problem solving and even creative thinking slowly diminish? Balancing high-tech with high touch can help strengthen our executive skills, those brain-based skills such as the ability to concentrate, focus and keep things in short-term memory. After all, the goal of technology was to increase productivity, not to eliminate paperwork. Using a paper planner and writing down my “To Do” list serves to ground me in reality. I can touch it and feel it and see my scheduled projects for the week the moment I open my planner. Writing down an appointment solidifies that meeting in my mind, while dictating it to a handheld device makes little impact, little commitment, and little chance I will even recall it the next morning. A pen in hand generates focus, attention, commitment, and a “do it now” mindset – something many of us lack. Written down, a name or number stays in working memory longer and has a greater chance of making it into long-term memory for later recall. Similarly, I prefer to make handwritten notes while on the telephone, write notes on an “Action Sheet” in meetings, and, heaven forbid, even write personal notes on hardcopy birthday cards and send them by snail mail. There is a place for digital devices. I do own an iPad, an iPhone and a laptop. And like many people I do online banking, use e-transfers, make calls with Skype, shop online, have a PayPal account, participate in social media, and correspond by email. But I also use a paper planner and a hard copy follow-up file system, a telephone log booklet, paper checklists, note pads, sticky notes as well as read hard copy books. Paperwork adds structure to my life. Because we live in a digital age of speed, I’m almost embarrassed to admit that I handwrite all my books and articles before dictating my handwritten material to my computer using voice-activated software. But I quickly regain my self-esteem when I recall the story of the tortoise and the hare. The objective was clearly not to run the fastest, but to win the race. Don’t be a computer clutter bug In praise of paper planners Managing your brain, part 12 Get maximum results with minimum effort.